We’ve been doing some deep dives into solar financing this week in order to prepare for our upcoming webinar. Turns out – surprise surprise – financing solar is a complex, finicky, multi-tentacled beast. That said, few solar projects can happen without it. Not only will a small minority of your prospective clients have the funds at hand to pay upfront for such a large-scale project, but financing plays a crucial role in loosening up your cash flow and avoiding unnecessary delays associated to the costs of materials, labour etc. So amidst the finicky acronyms and much-debated pros and cons of ownership vs leasing, we’ve teased out 3 key ways you can leverage solar financing to boost your sales. No matter whether they’re looking to lease, own or set up a power purchase agreement (PPA), one of the first things prospective solar customers want to know is how long it’ll take them to break even on their investment and start benefiting from exciting solar savings. This can vary greatly depending on how much risk they’re willing to take on, what interest rates they’re willing to consider and how much they can afford to pay a month, but one thing’s for sure, the wider the range of adapted options you can put on the table, the likelier you are to get them their signature on the dotted line. Increasingly, banks and financial institutions have created digital platforms like LightStream and Loanpal that connect directly to your solar CRM and allow you to apply for financing in just a few clicks. 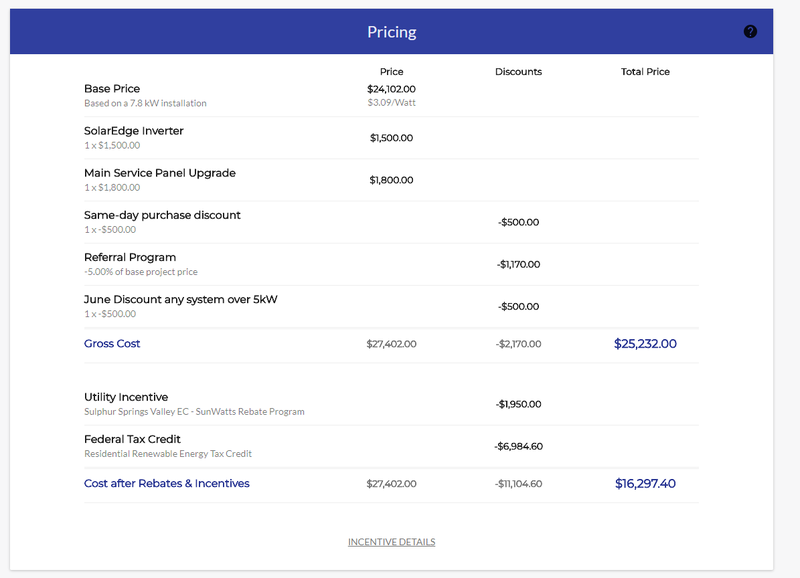 Solargraf also allows you to integrate your own financing partners and customize specs like rates, amortization and non-payment periods for each one. With those set up in your account, you can show prospective buyers how their different options might pan out in real time, and help them feel confident and informed enough to take the leap. As the solar investment industry develops better algorithms to evaluate risk and identify viable partners, it tends to consider new solar developers as higher risk investment – which means financing costs could spike up. As you build up your portfolio, be sure to keep close track of the number of MW’s installed, the number of years in business, the number of projects completed and the number of employees you’ve hired in order to build the credibility and trust you need from financial institutions to secure lower rates and flexible financial backing. Once you’ve secured multiple financing options at interesting rates, your job is to help homeowners identify the financing option that works best for their unique financial situation. To do so, it’s important to ask the right questions. Here are a few you should be sure to add to your list. Are they considering selling their home any time soon? Because recent data has shown that home buyers are willing to pay a premium of approx. $15k for a home with a solar array. Are they comfortable putting up their home as collateral? If so, a secured loan will offer lower interest rates and quicker ownership. Would they prefer stable energy costs at a higher rate, or varying energy costs at a lower one? This could help them decide between leasing a system or setting up a PPA. Are they in the know about the local and federal tax incentives they might be able to access? Financial incentives like the federal Investment Tax Credit (ITC) and SRECs can play a big role in easing the costs of ownership, and Solargraf automatically creates a repertoire of available incentives based on your country, state and region. Curious to find out more? Be sure to sign up for our webinar on Friday, September 21st 2018 webinar to find out more about solar financing.